The last post was about making the best out of trade shows and corporate events in 2009. So now I’d like to continue that discussion and talk about what to do next. What do you do with all the knowledge and contacts you’ve gained from your last event? First, have a morning meeting with your employees and partners to share what you have learned at an industry show or from a new business contact. Think about what new marketing products you can use that will be effective at your next event. Or maybe share some of the promotional swag you may have picked up. 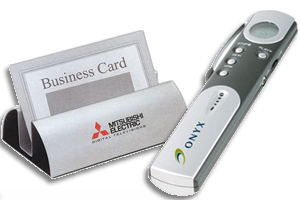 Executive custom voice recorders come in handy when there is an abundance of information to retain. It would be a great idea to take one along to your next business function. Next, extend your knowledge to networking and social groups or professional organizations. You’ll gain confidence from your peers and the reputation of a skilled professional. The third step is very important, follow up quickly. Business cards can get lost in the junk draw fast. Create a plan so that you can proficiently call or write a note to all of your new contacts. Use a business card holder to keep organized. Then provide your input by completing surveys or giving feedback to event planners. Your contribution will help improve a future trade show. Lastly, review the results. What have you learned? How will any of this information improve your sales and how will you use it?